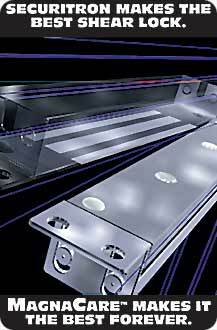 are designed to secure any type of door or gate that closes against a fixed stop. The product consists of an electromagnet which mounts on the fixed frame and a strike plate which mounts on the moving door or gate. The strike plate is delivered with fasteners that permit it to flex so that when the door closes, it automatically self aligns with the magnet. Magnetic force then takes over, strongly securing the door. Release is achieved by switching off power to the magnet. All Magna-locks are suitable for outdoor use (NEMA 4X equivalent), with an operating temperature range of -40 F to 140 F [-40 C to 60 C]. 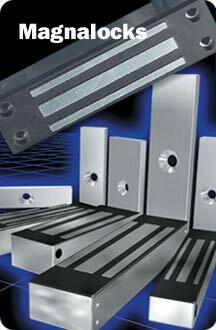 All ferrous metal surfaces are plated to MIL spec as well. THE XM1 and XM1N are complete, UL listed, dual voltage integrated electronic egress packages designed to operate on a magnetically secured door while fully complying with US building codes (BNBC, SBC, UBC, NFPA) under the rules for Access Controlled Egress Doors. 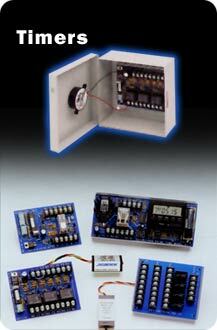 The XM-1 consist of the model XMS egress motion detector and the EEB2 integrated push button/timer. The EEB2 mounts in a single gang cut-out. The XM1N also includes the XMS motion detector but substitutes the EEB3N integrated push button/timer which mounts directly on a 1 ¾” narrow stile door frame. All models are UL listed and incorporate integral battery charging capability which keeps the sealed lead acid gel/cell at full charge for instantaneous stand-by power in case of line voltage failure. All models in the series are Class 2 rated by UL which means that output wiring need not be run in conduit. 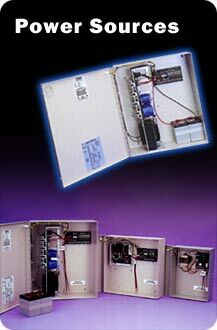 The BPS-12-1 and BPS-24-1 are one amp units that incorporate a fused AC input and a regulated DC output. A 2.5 Amp current limiting automatic breaker protects the stand-by batteries from driving into a short circuit. Plus, in the event of a DC short, the supply’s regulator will go into thermal cut-off, switching off the output. The power supply enclosure is sized large enough to include at least two optional four amp-hour batteries and the unit can charge up to a 20 AH pack (batteries mounted externally). and outstanding line-up of accessory timers and logic boards with the features you need to complete or enhance any security installations. 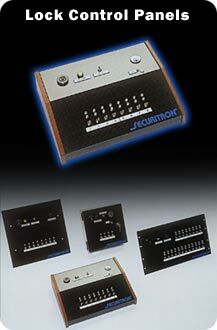 Circuit boards are supplied with a plastic snap-trak for mounting or are furnished in a plastic enclosure. The LCP Series panel is designed to operate any DC electric lock or strike that operates on 12 or 24 volts (fail safe or fail secure.) 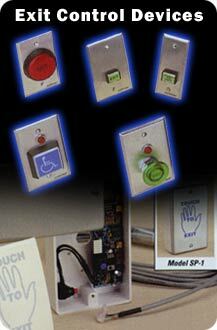 Other electric locks can be accommodated by adding relays. The panel is constructed of control zones supplied in multiples of four. A single multi-color monitoring LED per zone displays four possible conditions of the lock: Green shows that the zone is secure and this condition may be driven from a door switch, lock status switch or the power status of the lock. “Off” shows that the lock has been “legally” released from either the panel control switch or from a remote switch at the door. In this condition, the toggle switch itself illuminates yellow. Red is the alarm condition showing that a lock which should be secure is not reporting secure. This condition is latching and is reset from a momentary switch once the zone had been re secured. A alert accompanies the red “violation” condition. Orange shows that the zone has been re secured and is ready for alarm reset. After reset, the indicator terns green again. The Un Latch is a completely new type of electric door releasing device which sweeps away the limitations inherent in traditional electric strike designs. The Un Latch screws into the existing doorframe in seconds. There is no need for routing a special cut-out. This not only saves on installation labor, but maintains the original strength and integrity of the door frame and yields a fully concealed installation for maximum esthetic appeal. The Unlatch is highly universal in that one version will operate any North American cylindrical type dead latch or spring latch and installs in wood, steel or aluminum door frames. Unlike conventional electric strikes, the Un Latch also releases under pressure and includes a latch status monitoring output as a standard feature. The Un Latch truly merits being called revolutionary. 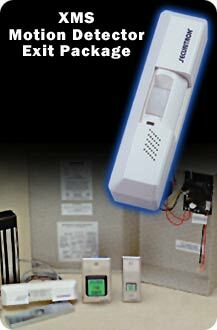 An access device (such as a card reader or digital keypad) activates the Un-Latch for controlled entry. Egress is accomplished by simply turning the lock set lever or knob from the inside. Conventional electric strikes include a plate called the keeper or gate which is electrically released to swing out and thereby allows the latch to move through the space the keeper has vacated. This keeper movement is the reason why a special cut needs to be made in the doorframe. The cut-out provides a space for the keeper to swing in to. 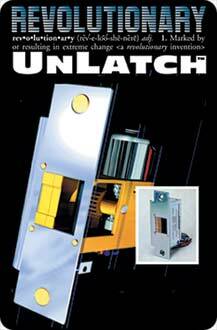 The Un-Latch however uses a motor driven plunger to push the latch back in to the door. There is no keeper and no reason to route out the doorframe. For dead latches, a second plunger separately controls the dead latch pin which is normally maintained in the retracted state for optimum security. The dead latch plunger then releases the dead latch pin just before the first plunger pushes in the spring latch to release the door. When the door is re-closed, the Un Latch automatically re-secures it including reestablishing full dead latch security. The Un-Latch’s unique and novel operation yields an unprecedented array of benefits.